Somewhere in my distant past (as I have mentioned before) I was a boy scout. The real reason I became a boy scout was because each year the troop got to go to Disneyland. There was just one requirement to go on the trip and that was you needed to an active member of the troop. So I joined, as I really didn’t want to pass up a trip to Disneyland. After the trip to Disneyland I would attend almost every meeting for a few months and then my attendance would start to drop off. At some point about a year later I would see a friend at school and he would tell me that the trip to Disneyland had been scheduled and I would start coming to the meetings again. As you might have guessed I was a real fan of Disneyland. I also had pretty good attendance when the camping trips and the other outings and festivals were scheduled. You know, I have to say, I pretty much liked the scouting program when we went out somewhere to do activities rather than just the times we met at the troops club house and played dodge ball. Of course, dodge ball meant that the bigger guys would have fun throwing the balls at the smaller kids as they huddled in the middle of the circle… I was a little guy, so dodge ball wasn’t that much fun for me. In the summer one of the activities (that I liked) was to take a week-long camping trip at a lake up in the hills near by. It was about a 45-minute drive from town and then from the parking lot you needed to hike about 20 to 30 minutes into the hills hauling all of our supplies and gear. I can remember the weeks leading up to the camping trip where we would meet as a group and determine what supplies we would need to bring and who would be in charge of getting them. We planned meals for each day and from those we made shopping lists. We always had grand thoughts of what we wanted to eat at each meal (especially breakfast) and often the scoutmaster would try to remind us that it would be difficult to transport 4 dozen eggs in our backpacks and that we should really pare it down to only one or two really good breakfasts and then maybe pancakes (from a mix) for other days and oatmeal for others still. Regardless of all the warnings, our troop always had very ambitious menus and we packed in the requisite number of eggs without incident every year. When we did have pancakes our scoutmaster would put the batter in a squeeze bottle and make these intricate designs with the batter, sometimes it was just a Mickey Mouse face, complete with shadows and highlights, other times he would write out our names, and sometimes he would just make random art using blueberries or chocolate chips. Besides breakfast our dinners were equally as good, though there was some freeze dried food, a few nights of pasta and a fair amount of instant potatoes. All in all, I think, our troop always had the best food of any of the other troops on the grounds. Our troop even planned for daytime snacks, like chips and dip and fresh fruit, and evening snacks like cookies, cakes (prepackaged) and pies (and yes, some of those were made by Hostess). Of course this meant that on the hike to our site we took quite a bit more time than other kids because we had to lug very full packs with all of our clothes, tents, and sleeping bags plus camping stoves (including propane bottles) coolers, and ice chests, all loaded with canned goods, frozen meats, vegetables and those ever precious eggs. The trip out, on the other hand was much faster. There were always things to do at the lake: canoeing, boating, hiking, and of course snipe hunting. My first snipe hunt was pretty uneventful, perhaps because I had already heard stories of snipe hunting so I was not surprised when the older kids left a few of us alone out in the dark with nothing but a trash bag. The guys made some noises in the bushes for a little while but soon it got quiet and I remember saying to other kids matter-of-factly, “Okay, they ditched us, what do you want to do now?” I am pretty sure we hiked down the road that night to the lake and sat out on the dock for a while before making our way back to camp. When we did get back to camp, we just simply slipped into the group that was around the fire-pit and roasted marshmallows along with everyone else. The older kids laughed at us and even claimed that they set a new troop record for the amount of time it took us to get back to camp. We never let on that we knew the gag and actually spent time at the lake instead of sitting on the road in the dark… they never would have believed us anyway. On a different trip, at the end of the week, as we cleaned our campsite (you always had to clean for a final inspection) we were gathered into a circle by the scoutmaster who stated that we had all performed well that week with our assigned duties and congratulated us on how well we had worked together as a team. Just as I thought someone was going to break out into a rousing version of “Michael Row Your Boat Ashore” he changed his tone just slightly and told us that the inspection for the final day was going to be provided by one of the higher ups in the scouting world… You know some “famous scout” from troop headquarters, and that the campsite with the best final inspection score would get some sort of super grand prize. Now if you know me at all you might know that I am a born skeptic, and right off the bat this story of some “famous scout” that we have never heard of before was sounding a bit suspicious. Anyway, the scout master continued and he encouraged each of us to make sure we had everything in perfect order for the inspection… oh, and, we should “be aware that “famous scout” looks at everything so we better be sure we are not missing anything, last year someone forgot to pack an eye tourniquet and they lost the grand prize for their entire troop”. This of course prompted all the younger scouts to panic for none of us had an eye tourniquet… Well, “no worries”, one of the older scouts chimed in, “there is an extra eye tourniquet over at troop 2 and maybe if asked nicely they would lend it to us… but we had better run as the inspector is due any minute”. In a stampeded like fashion all of the younger scouts (me included) ran over to troop 2 to find the scoutmaster, while the older kids encouraged us to “run” and “hurry”. When we got to troop 2 almost every kid yelled out things like “we need an eye tourniquet”, “can we borrow an eye tourniquet?” “You need to lend us an eye tourniquet”. “Ah yes, you can borrow an eye tourniquet from us” we were told by the leader of troop 2, “no problem… but before I can give it to you we need a bacon stretcher and we hear there is an extra one over at troop 10… get us that and the eye tourniquet is yours… but you better run because the inspector will be here in just a few minutes”. Off like a shot ran all the other kids, across the camp onward to troop 10, all the while hearing from everyone behind, “run… run… hurry…” I am sure you can see where this is going, and I can tell you there were about 15 troops up at the campground that week and this was obviously a well-coordinated prank. While the other scouts in my troop raced over to troop 10, my mind was starting to now question the whole thing. “Eye Tourniquet? I’ve never heard of such a thing… how would that even work? Now a “bacon stretcher”??? There is surely no such thing as a bacon stretcher”. I remember standing there, looking at the leader of troop 2 and thinking to myself - this guy has got to be kidding. As I turned and left, my troop mates well in front of me already, my pace was only at a quick walk (despite the other scouts screaming at me to run). In retrospect I might have gone on all the way to troop 10 and maybe even hung in there for a few more troops before throwing in the towel and accepting this was an elaborate prank to get us to burn off energy before we packed ourselves into the cars for the trip home, but for what I feel was the fatal flaw in the prank. As I walked away from troop 2, on my way to troop 10, I had to walk right past our campsite and as I approached I could hear the scouts that were still there screaming for everyone to run, which I thought was odd… who were they yelling at? Then as I looked around I noticed groups of other scouts all in hurried fashion running the trails between the campsites. I realized then that every troop was doing the same thing our troop was and to me it just seemed impossible that every troop forgot something and that every troop would be trying to borrow it from another troop who just happened to have an extra one. My paced slowed down further as I passed by my campsite and caught a glimpse of the older scouts sitting at the picnic table laughing and yelling and seeming to be having the best time… not very dignified behavior when your expecting a “famous scout” at any minute. The final straw for me was hearing one scout say to his friend “I think James figured it out”. It was at that point I went back to my tent and finished packing my bags. Don’t get me wrong, this is a great prank, and in the end everyone was nearly in tears laughing at the ridiculous things they were asked to find. Honestly, I only remember the eye tourniquet and the bacon stretcher, but the others were just as odd. The thing is you’re so caught up in the running and urgency of it all you don’t stop to listen to what the person is actually asking for and how ridiculous whatever it is… is. I mean really how can you put a tourniquet on your eye? I have to say…props to the all the scoutmasters who must have gotten together one night while we all slept, (probably down by the commissary where they might have had a hidden stash of alcohol) and planned this elaborate prank. The first time I read about an Olive Oil cake, I have to tell you thoughts of snipe hunting and eye tourniquets came flooding back right away. I mean a cake made out of olive oil, how would that work? How does the oil become cake? 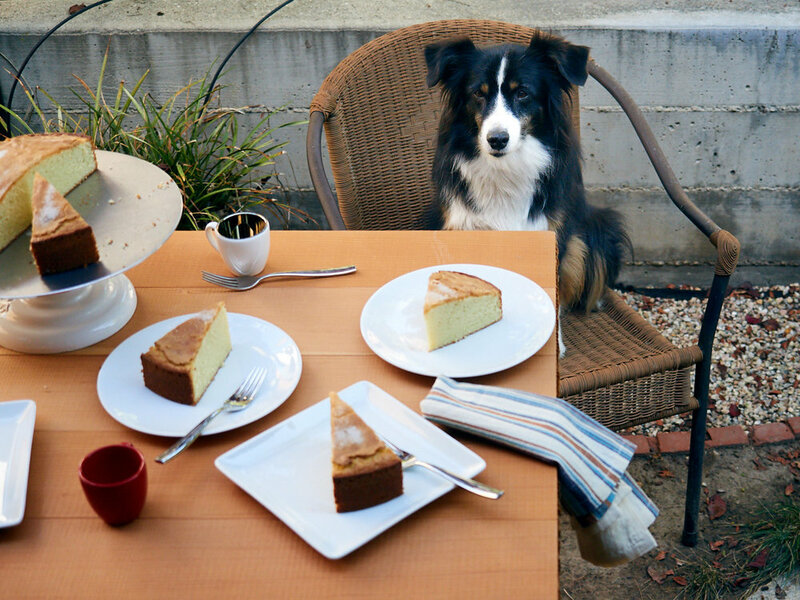 And really… olive cake? I was so sure this was some prank being pulled on me and the other fine readers of Food and Wine magazine, I actually had to check to see if it was the April Fools issue. After reading a bit more I was convinced it was a real thing but I never really had any ambition to try it. I just could not wrap my head around a cake without butter. After that, I never really thought about olive oil cake again. One day I’m watching America’s Test Kitchen and one of their segments is on olive oil cake. Ok, I thought, I’ll keep watching. They’re making it sound good, it seems like an easy recipe, I actually have all the ingredients on hand, and the end result looked like a perfectly delicious cake. So I decided to give it a try. Boy, I am so glad I did. It really is a fantastic little cake. 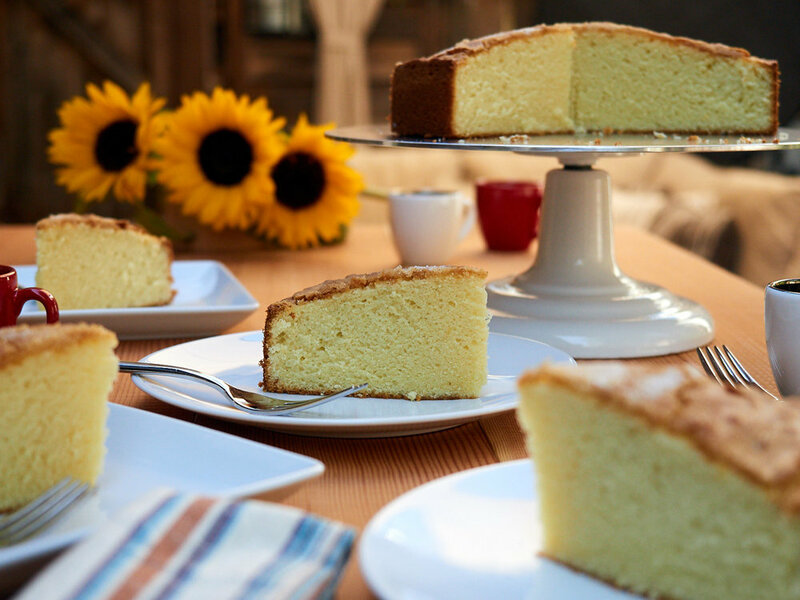 It’s perfect to serve with a cup of coffee or tea and as for the flavor… Well, that’s the best part; the olive oil flavor is subtle and adds just a little fruitiness but doesn’t overpower the cake. My initial thought was that it would be like drinking olive oil from the bottle, but that is definitely not the case. To make it you will need a stand mixer fitted with the whisk attachment (an electric mixer will also work), a 9-inch spring-form pan, and either nonstick cooking spray or vegetable shortening for greasing the pan. 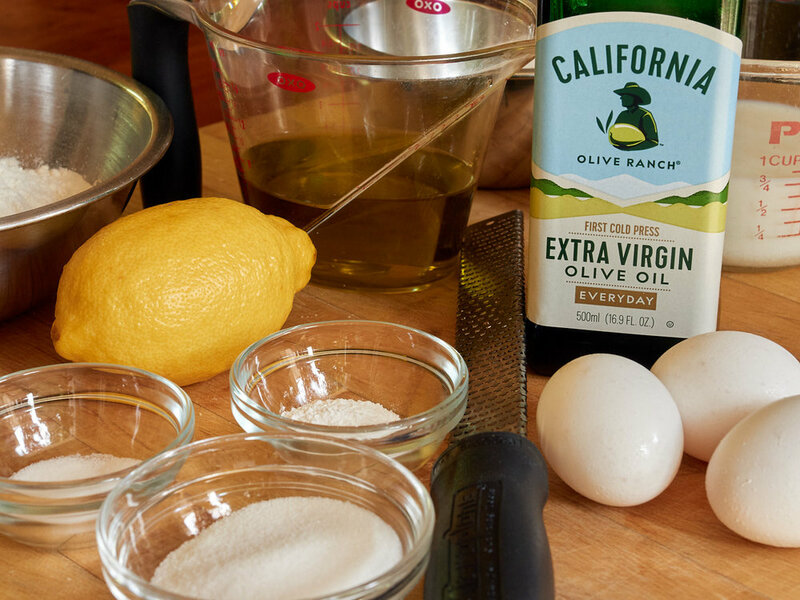 As for the olive oil, I use (and the bakers at America’s Test Kitchen also recommend) California Olive Ranch extra-virgin olive oil. You don’t want a premium olive oil here, just a good grocery store olive oil will do. Start by preheating the oven to 350°F with the oven rack in the center position. In a small bowl whisk together the flour, the baking powder, and the salt and set that aside. Use a stand mixer fitted with the whisk attachment to whip the eggs on medium speed until they are foamy, about 1 minute. Add in the 1¼ cups of sugar and the lemon zest and increase the speed to high, whipping until the mixture is very fluffy and pale yellow, which takes about 3 minutes. Next, turn the mixer to medium speed and, with the mixer running, slowly pour in the olive oil. Mix until oil is fully incorporated, about 1 minute. Stop the mixer and add half of the flour mixture, then mix on low speed for about 1 minute until it is incorporated. Scraping down the bowl as necessary. Add in the milk and mix on low speed until combined, about 30 seconds. Finally, add in the remaining flour mixture and mix, again on low speed, just until incorporated, about 1 minute more and scraping down the bowl as necessary. Transfer the batter to the prepared springform pan and sprinkle the remaining 2 tablespoons sugar evenly over the entire surface. While the cake bakes this sugar layer will puff up and separate from the top of the cake – Don’t panic, it should do that, and it will settle somewhat, when the cake is cooled creating a little bit of a semi-crispy top. Bake the cake for 40 to 45 minutes until it is a deep golden brown and a toothpick inserted into the center comes out with few crumbs attached. Set the pan on a wire rack and allow the cake to cool for 15 minutes, then remove the outer ring from the pan and allow the cake to cool completely. So, that’s the olive oil cake, and it is a cake I will be coming back to quite often, not only for its simplicity but also for its wonderful texture and flavor. I hope you’ll give it a try and let me know how it comes out.